I am officially over halfway done quilting Blue Spring Rain. But the backing is giving me MAJOR fits, so I have decided to become a crazy rebel – I’m quilting the second half of the quilt with the backing upright so that I stand a chance of fending off tucks. I did a little bit to test it out, and I think it will be a bit more wonky this way but I’m OK with wonky… I am NOT OK with lots of tucks in the backing. I tried re-basting the quilt several times today, so now that I have a method I am going to step away from the sewing machine and take a few deep breaths. I should be able to finally finish the quilting on this quilt this week, barring any other quilting troubles (fingers crossed)! Ha! Blue Spring Rain – Getting There! In other news, I spent most of my “quilting” time this weekend thinking about the branding for my quilt work. I watched the Modern Quilt Guild’s Webinar on “Starting a Business: Panel Discussion” this past Wednesday, and one thing that Shea of Empty Bobbin Sewing Studio mentioned that resonated with me was that she was super happy with her logo. Which made me think about a lot of things (like even re-naming/re-branding, which would be painful! ), but ultimately I think that I am going to work to create a super fun retro vibe for my logo and I have a temporary adjustment in place now. And here are some absolutely fabulous images I have been using to inspire me to think about how to create a logo for Quilting Jetgirl. 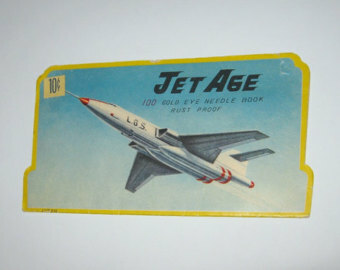 It is pretty exciting that they are all sewing needles with blue and yellow packaging/advertising with space / jet / rocket themes. Love the back of this quilt. No wonder I loved it… FMQ is my nemesis and I am in awe of anyone who does it. I hope those fixes work for you–sounds like such a frustrating issue! I love the new logo! 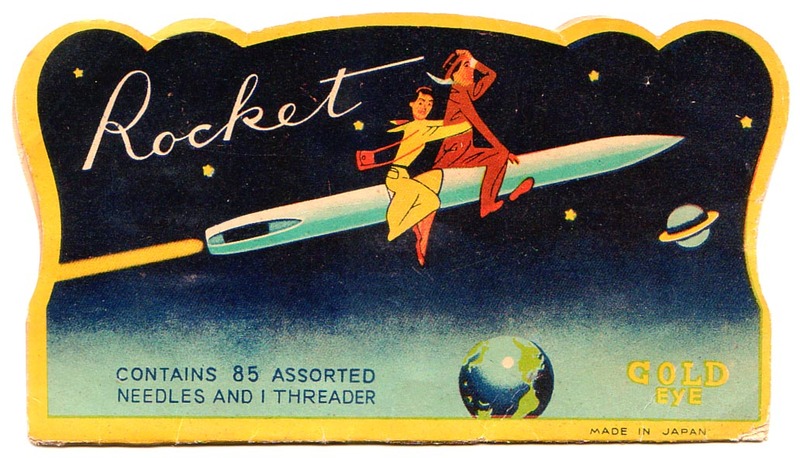 The needle in the center of the rocket is very cute/clever. I haven’t really thought of having one for my blog yet, though yours is certainly inspiring. That happens some times. You will get it done. I agree – it’s such a pain when the backing doesn’t cooperate! Your quilting looks great though and I love your rocket needle logo! I am working up the courage to sit down and finish it up. Thank you for stopping by! Good luck for the rest of quilting. Looking good! I come across a tuck every now and then and usually rip it out. I have seen a couple of things that I think will work to fix it. One is to spray starch the batting top and back and stick your quilt to it. It really makes it cling together so no tucks. Also Jacquie Gearing says she does her quilts in quadrants. She quilts one then back to the iron and press and baste again. Thanks for stopping by! I definitely work in quadrants, which has saved me a lot of extra grief on this quilt, I think. I was able to rip out the tucks and fix and smooth them out. In the end, I think it will look great and no one will ever know the difficulties it gave me. I have never played around with spray starch; I might look into it in the future!